Launching this week, The International Private Members Club in central London have announced their state-of-the-art live poker webcast. Streaming directly from The International, the high-definition live-feed can be viewed through Gutshot.com and features poker action from the club as it happens. The webcast consists of three high-quality cameras following the play; two are focused on the players themselves with the third acting as a dedicated flop-cam, ensuring that every turn of a card is captured. The cutting-edge technology guarantees that picture, sound and streaming quality are all of an excellent standard. Access to the webcast is free and can be viewed at Gutshot.com. Beginning at 7pm GMT every day, all evening tournaments will have a feature table streaming from start to finish. This weekend’s £1,000 PSOP Main Event will be broadcast from 4pm GMT on Saturday and promises to deliver some top-class poker and big-name players to the screen. During these larger events the stream will also consist of live commentary and punditry from some of the world’s top poker pros all hosted by Gutshot’s very own Barry ‘The Bully’ Martin. 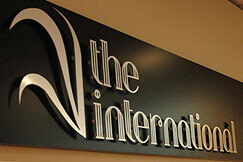 Players wishing to be featured on the webcast should visit The International Club at 53-55 East Road, London, N1 6AH. Call 020 7490 5400 or email info@theintclub.com. It is also possible to watch it on your MAC. If you need info on Mac Poker Sites and other poker opportunities click on the previous link. This entry was posted on Wednesday, September 2nd, 2009 at 5:05 pm and is filed under Poker News. You can follow any responses to this entry through the RSS 2.0 feed. You can leave a response, or trackback from your own site.